The Downieville Bottle Show was started in the early 1990's as the Mother Lode Bottle Show by Bill Ham and Warren Friedrich with help from Richard Siri and the late Jess Jones. If you were one of the early attendees or show dealers you remember the 1997 Western Whiskey Extravaganza that featured the top western whiskies and seminar by the late guru of western whiskies John Thomas. The 1998 show featured a display of the most desirable Slug Plate and Picture Whiskies displayed by collectors from all over the west. The Downieville show has had its highlights over the years and also many hurdles to overcome to keep the show relevant and entertaining. 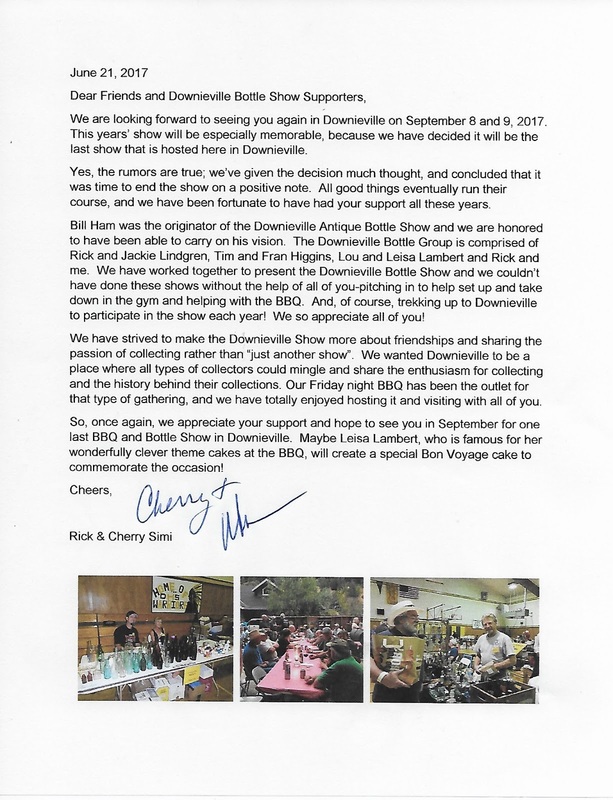 Downieville is a small remote community and the required services and resources to keep an enjoyable bottle show up and running have dwindled over the years. Although this is Downieville's last show you can count on the members of the Downieville Bottle Group to do all they can to support the ongoing western bottle shows. There's not much I can add, that Dale hasn't already said. Your efforts are, and always will be, greatly appreciated. Many thanks for the great times and memories! I'm sorry to hear the Downiville show is coming to an end. It has been fun to visit with my family as there are things for everyone to do beyond bottles. For the last 3 years we have made it a family weekend and have camped at Union Flat to enjoy the river. How nice it has been to ogle our finds from the bottle show while overlooking the river and preparing dinner over an open fire. Though this will will be our last year I hope to make it special as I intend to invite everyone form the 49er Bottle Club to camp with us. Hopefully, I will find some bottle folks to join us. Though the show will end we still have our memories and photos of the bottle displays, sitting on the howitzers, our 6 month old daughters first camping trip, the gallows, swimming, getting a free gold nugget from the man at the museum, and looking for gold and bear sign. Further, the nice Dr. Motts Tonic I got at the show will always be a remembrance . Sincerely, thank you for the memories everyone. The Mother of all Criers?